Karla Creative: BBQ Chicken, Tornadoes, and Leaks, Oh my! BBQ Chicken, Tornadoes, and Leaks, Oh my! I had planned on sharing this on Tuesday, instead we spent the evening in the basement. Apparently tornado season has already begun here in Kansas. It was one heck of a storm, wind blowing the rain amazingly hard. We ended up with water inside blown in under the back door. We also had some leaks in the basement through cracks in the wall and through a crack in the floor! We had been wanting to clean out all the boxes from that room anyhow, this just forced us to do it! This "BBQ Chicken" is one of my super easy go-to meals that has become a favorite around here. It is also one I have taken as a meal to friends. There are two main ingredients: chicken breasts & barbecue sauce. Please feel free to admire the pretty flowers the love of my life brought home to me 'just because'! 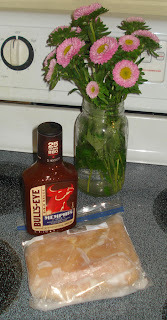 I use whatever BBQ sauce I have on hand, this one ended up being one of my hubby's favorites. I use anywhere from 1 to 1 1/2 pounds of chicken breast, straight from the freezer. 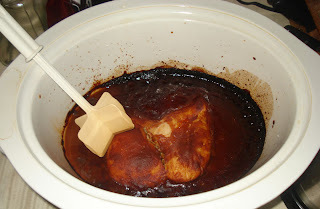 I put the frozen chicken into my crock pot, then dump the sauce right on top. I usually add a little water to the bottle to get out all the saucy goodness and add that to the crock pot also. Cover, cook on low 8 hours or high 4 hours - works fine either way. If you have the time and like to bake, you could whip up some home made buns at this point! Once the time is up, you will need to shred the chicken. This is where one of my favorite kitchen tools comes in, the chop-stir. I am able to use it to shred up the cooked chicken in less than a minute without having to get close to the hot food! I also love to use my chop-stir when cooking ground beef and sausage as it gets it into small pieces and I feel like it helps to extend the food, thereby also saving me money! Don't worry about the burnt looking area, it doesn't affect the taste. The chop-stir makes quick work of shredding the chicken. See how quick that was! Now you are ready to eat, gather what you need and dig in! 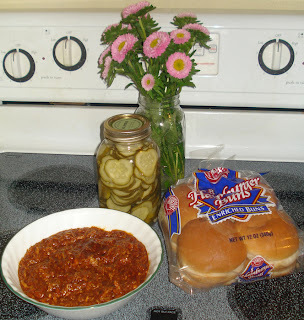 I serve it on buns with my home made pickles, we had raw veggies and dip with ours on Tuesday. It made enough to serve all 4 of us TWICE! We had the leftovers tonight and it was just as delicious as the first time! This is really a great meal any time of year and can be adjusted to your tastes by switching up the sauce flavor. 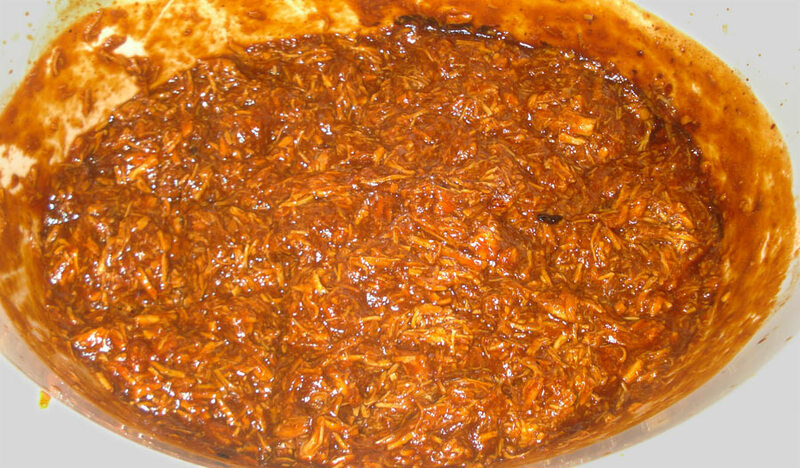 Another twist on this would be to make chicken taco meat using a can of Rotel tomatoes and a packet of taco seasoning (or homemade - this is what I use) shred it at the end of the cook time and serve wrapped in tortillas. Everyone at our house really likes that also! 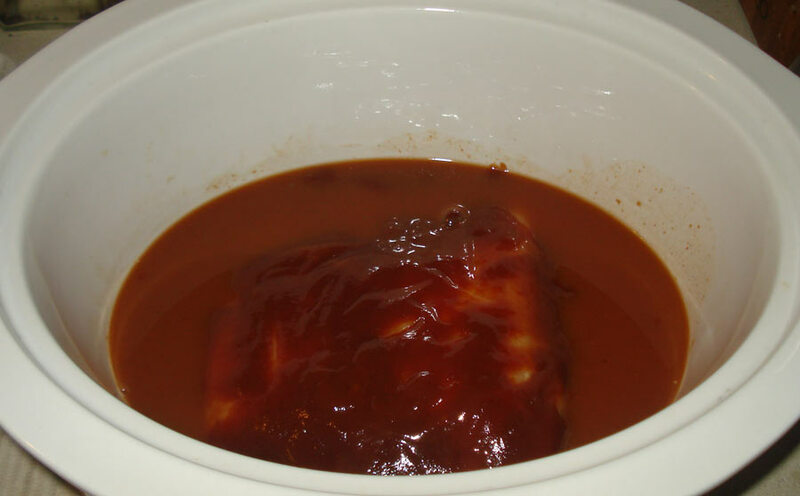 I love my crock pot and how easily I can prepare a meal for my family without spending all day in the kitchen!